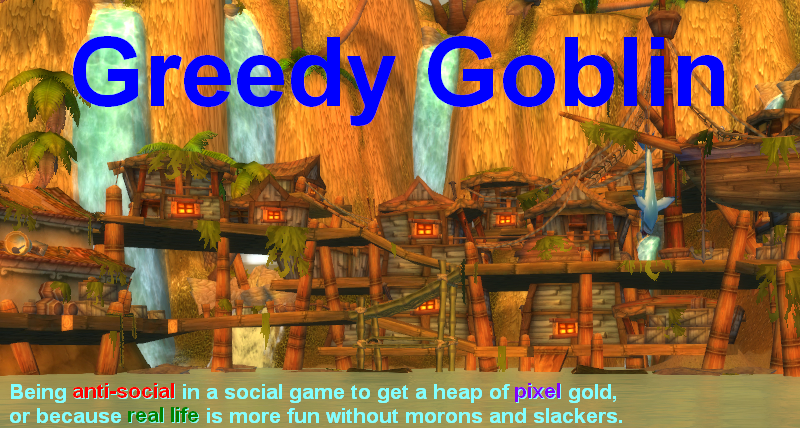 Greedy goblin: Mean guys of the week. Mean guys of the week. I did not get any more submissions for this topic. If you won't send, I can't post. Since I have half the normal visitor count on weekends, I won't post normal posts on weekends. So if you won't send more submissions, there won't be Saturday post. Where do I submit the screenshots? Looked over the site, couldn't find it and I'm very lazy. You send an e-mail to me. The e-mail is in the goblin portrait. Should I start looking around for other signs of the Apocalypse? It looks like that post in realm forum has been deleted. The forum topic has already been deleted. Which only implies it must have been full of epic QQ. Sadly, the forum topic has been deleted. @Gevlon i'd like to hear your opinions about these gasino chars in servers... You know the guys that spam trade channel " if u roll 66 or over u get *2 the money u bid". Casinos are illegal in WoW. Report them. Not only are casinos and street gambling bannable offenses, the game is (obviously) rigged in the house's favor (1/3 chance to double your money and 2/3 to loose it, usually). There's no real monetary advantage in it. If you get a good game going as the house you won't make more g/hr than gevlon's scibbling business, or just about anybody our jc businesses. But our businesses have no risk of having all of our assets seized, unlike the street gambling(banned accounts have no access to their assets). Gevlon, it's not easy to get screenshots for this section, at least for me. 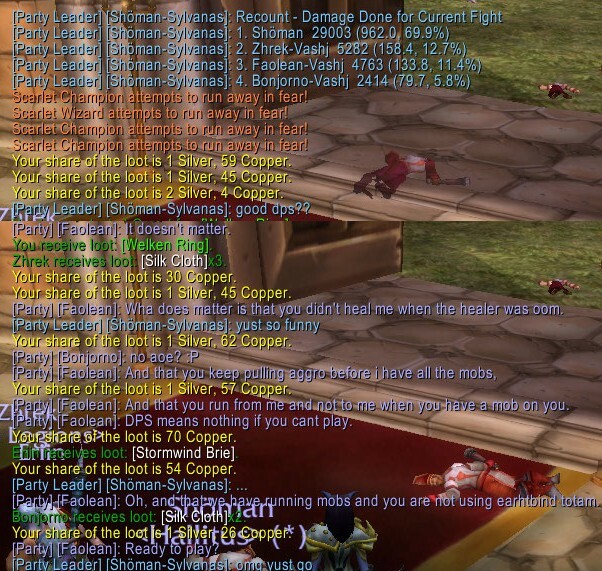 Sadly, bad dps'ers are dominant on almost all pugs. If you stand up and tell them that it's not funny to pull before the tank and then blame the healer/tank for his death, they will kick YOU from the group because you're "slowing the group down" by berating the moron dps. When M&S make the rules, frustration is ensured. Either you follow their rules and end the HC exhausted just for making it easy for them, or you tell them to do something more than /follow and spam AoE, and get insulted and kicked. That is hilarious it is good to see those types of idiots owned. blizz does not seem to consider the gambling banable. the spam associated is bannable. i've been working on a "no risk to the house" gambling game idea. players join group with "house". if you have more than 4 players then you form a raid and let up to 39 play. it encourages people to bet higher cos they have a better chance of winning with a 10000 bet then a 1000 bet. but in general i dont know if its worth my time spamming trade to set it up. Statistically, casinos are always bad for goblins. That is, unless one owns them, or happens to be exceptionally good at playing blackjack using basic strategy + card counting (which swings the house advantage into negative). amazingly... I tried to be mean with like... 3 guys in a random HC I was in, to get a screenshot. Commenting the protpally not having any gems/enchants, the ret pally not buffing at all (nor the prot...), and the warlock doing less damage than me (holy priest), but none of them responded. Same here, I'am not the kind of guy that bend to a social trend, and more when as tank I out dps all dps in the group (and trust me doing full pug heroic dungeon is always like that). I usually leave the third group, we've kick every one in the first one (and get good memories from this, btw we lost 10 minutes with this, but we have fun) and don't say anything more in the others as they can't understand (stupid M or S) or this won't ever change the face of the world. This topic is not working. There are only so many people you can encourage to go out and be a jerk to others, and only the biggest jerks of those will actually put forth the effort to waste their time trying to screencap an incident worthy of your posting. It was a failing idea from the start. I would be embarassed at myself as a blogger if I told people to go out and start arguments with strangers without having any clue at all as to why they choose to play the way they do. Then, you tell them to send you a screenshot so you can celebrate them for acting like a hard-on? Hey everyone, go beat up someone on a street corner and send me photo! No really, we're actually helping them! I sent you one and it didn't show up. It probably wasn't detailed enough, I wasn't screenshotting the whole run. The idea is not to be mean at all cost. I think the idea is more : have fun with what you can. I usually run 2 heroic a day, and I havn't found a single day were I wasn't having fun at someone during theses while chatting on vent. Now at least I just tell them what to do if I can, and they just seem to accept it most of the time. go beat up someone on a street corner and send me photo, yeah if that would teach him not to buy drugs or just to say hi when someone says hi, i'll do it. The point is not to be mean, the point is that if you are already mean you have a place to share it with others. Only after unloading on the guy did i remeber that Gevlon is seeking photos of this, so i sent one. I also wasn't unloaidng on him just becuase, i actually wanted him to be better at the game and stop playing so bad while ONLY worrying about his damn meter. That's absolutely what this is about, promoting intolerance and bad behavior. Pointing out ways for someone to improve is one thing. Acting like a jack-off and berating someone hoping it will get Gevlon to bare his left cheek for you to smooch is another. That's exactly what this topic is encouraging people to do. If it was about having fun, why don't you all go out and play like fools yourselves and see if you can't get someone to tear you a new one instead? That would be much funnier (there are some pretty intense people out there) and probably more of a challenge. At least then you wouldn't be picking on inexperienced players or possibly kids. You would just be picking on other "mean guys".